Exotic. Sensual. Intense. Sumptuous. All words that more than adequately describe Stella McCartney's gorgeous perfume, aptly named -- what else? -- Stella. To be honest, I wasn't sure I would like the fragrance when I first heard about it. A combination of rose, peony, mandarin and amber? It seemed like a mix of too many different kinds of notes that just wouldn't fit well together. But the bottle more than intrigued me, with the smoky amethyst hue and stunning cut glass silhouette. And the fact that "STELLA" was emblazoned across the lacquered black cap in miniature rhinestones, adding just the right amount of bling, sure didn't hurt. So imagine my surprise and delight when I opened the bottle, sprayed vigorously into my bedroom and stepped through a cloud of what I can only describe as "delicious wonderment." I felt as though I had been immediately transported to a different time ... to me, the scent evokes the feel of a geisha in the ancient Orient. It's strong without being overpowering, staunchly feminine but with a sense of true self, sophisticated while not overly girly. The melding of floral notes with a touch of citrus and a heart of amber works wondrously well here. 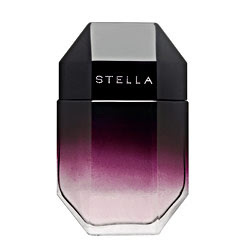 Stella McCartney Stella retails for $92 at sephora.com.